For a german review, please click here. While engrossed in his thoughts, the clapper of the bell wakes up Jean Raymond to bring him back into his grim reality. For a long time he has been running away, escaping from the crusaders all over Languedoc, a province in the middle of southern France. The Church wanted to hunt them down, the Cathars, monks who used to preach about Jesus and his vow of poverty and life itself without material goods. It was something from this world and he knew it; he could feel it. This fear came from within himself. His soul was shrinking because he could feel that this evil was growing inside of these walls. Another realilty has awakened. L´Abbaye des Morts (engl. 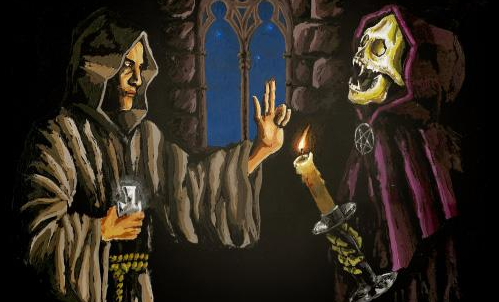 The Abbey of the Death) is a game programmed by Juan A. Becerra (a.k.a. Locomalito) and Javier Garcia (a.k.a. Gryzor87), who are close friends. The Mega Drive version has been programmed by Mun (a.k.a. MoonWatcherMD) in one year of hard work. Becerra creates video games for many years, and those games are dedicated to the classic video games from the 80s. With the release of L´Abbaye des Morts, another dream came true for him. The game has already been released on september 10th, 2010 as a freeware and gamers call it a classic title by now. It was even released for the ZX Spectrum on original MCs. PlayOnRetro´s Mega Drive version contains all versions of the game that have been released so far, including versions for the C64, the Gameboy and MSX; all fully playable and comparable with each other. By the way, music and sound effects of the C64 version have been created by Manuel Gomez a.k.a. Baron Ashler, who released Zombi Terror and Knights & Demons for the Mega Drive as well (I´ve released articles in german about both of the games). 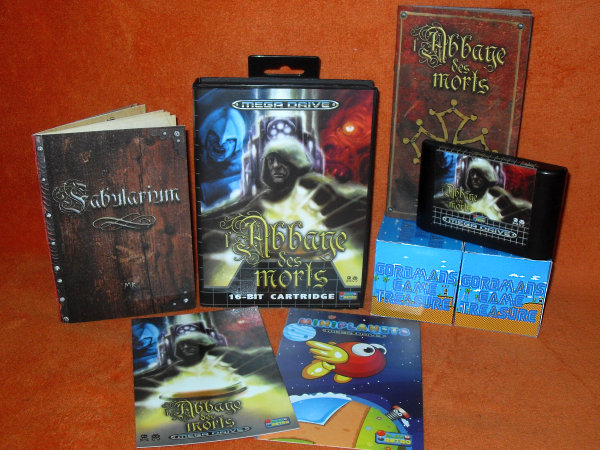 PlayOnRetro´s Felipe Monge was responsible for cover, design and layout; he is also the one who brought a campaign on his website to life, to release L´Abbaye des Morts in physical format - everything in cooperation with the respective developers. The project gained enough supporters and was realized very quickly, altough many issues appeared right after the ending of the campaign in the form of production mistakes and shipping damage. PlayOnRetro had lost a lot of money with these issues, which is painful for a non-profit project like this. But with a lot of effort and passion, they fastly shipped the games well packed in proprietary cardboard boxes. The price for a basic edition was 34,00€, the price for the deluxe edition was 53,00€. This deluxe edition came as a big box with structure, containing an instruction manual (made of strong paper), a postcard, a secret envelope, the Fabularium artbook (which could be pre-ordered alone for 6,00€) and a beanie with the logo of the game on it. The illustrations inside of the Fabularium artbook were created by an artist called Masterklown. 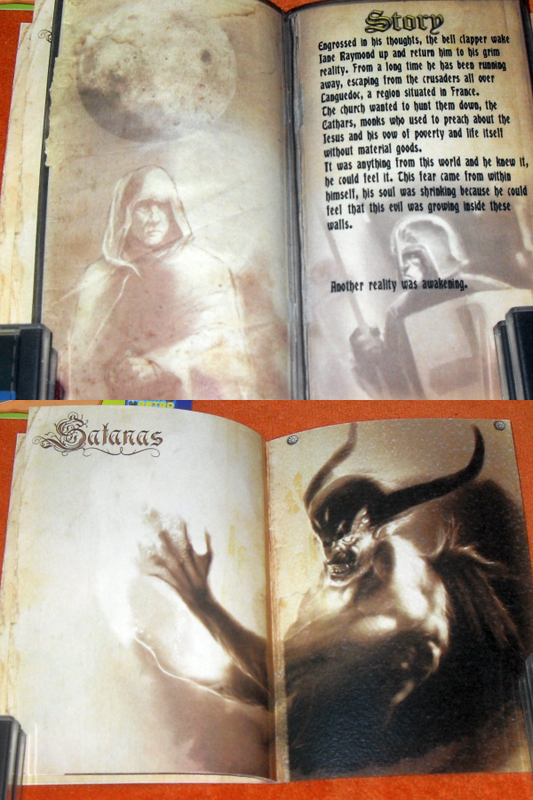 All editions of L´Abbaye des Morts came with a double-sided cover with different artworks on it. To really make sure to reach the goal of the campaign, a game called Miniplanets was included; it got a small number of pre-orders. Since many people missed the first campaign, PlayOnRetro started a second campaign in december 2017, which was successful again. As described at the top of this page, the story is about a Cathar called Jean Raymond who finds a safehold in an old church while running away from the crusaders. But Jean doesn´t know what´s behind the walls of this old abbey. Let´s take a look into human´s history: During the years 1200 and 1400, religious communities existed that followed the Catharism (I don´t know if that word exists in english, but this is a direct translation from german into english by me). The Cathars, also called Albigenses (named after the southern french town Albi) were hunted as heretics by the Church and got burned once the Church got them. The Church started the Albigensian Crusade, which began in 1209 and ended in 1229, where most Cathars got trapped and killed. The last arrested Cathar was recorded in 1342 in Florence, Italy; since 1400, all Cathars are officially gone, according to the Church. The story of the game is based on these events, since Jean is also escaping by the Crusaders. The only difference are the monsters Jean encounters inside of the abbey. The controls are quite simple; Jean can jump with all the buttons A, B and C. He can also crouch if the player holds down the directional pad. The Cathars didn´t own any material goods, so Jean has no items or similar helpful things except his faith that he needs to escape from the abbey. He has to collect twelve crosses to finally confront Satan. During the game, the player travels over 23 different screens, filled with some unique and some recurring monsters. Between these monsters are skeletons, rats and demons, but also the Death and the so called ´Pestilent Beast´. There are also some hostile plants that are dangerous for Jean. There are many stone mechanisms, which are safe points (or checkpoints). The player starts at the last safe point after losing a life. If your number of lives is getting low, you can collect more at some places. Not all areas of the abbey are accessible from the beginning; there are switches to be used, bells to ring and scrolls to collect. Some crosses are cursed, so it´s needed to find a way to take away the ban from them to collect them. There are two difficulties: Normal and hard. If the game can be completed in hard mode, another adventure starts. Not all screens are musically accentuated; at some screens, there are only short sound sequences or melodies followed by silence. The sound effects are good and the graphics - Jean, the monsters and backgrounds - are brilliant as well. Everything in line creates a consistent atmosphere. There are no bugs in this game. L´Abbaye des Morts is a short, but genious game. Back when I´ve invested in this project on PlayOnRetro´s website, I didn´t expected the huge potential behind it. I was curious about the story, so I began to do some research about the Cathars to read more about their fate. The sound & music as well as the graphics are all great, altough The Abbey of the Death cannot reach the levels of other horror games like Chakan and the Splatterhouse games. But L´Abbaye des Morts is shining with a special atmosphere that changes on every single screen; the player´s eye will see new colors and enemies all the time and is forced to rethink again and again, to avoid to walk in the arms of the more dangerous monsters. I especially like the hidden gardens and underground rivers. A very interesting fact: One of the monsters - The Boogeyman - varies from game to game, in colors and speed. If you encounter him in his purple form, he is able to cost you many lives! It´s an amazing idea. I completed the game in hard mode - and some questions came to my mind after. Especially when it comes to some of the screens. Right at the beginning of the game, Jean enters a room called Wine Supplies - why the hell are wine barrels stored in a church? Did the Christians boozing alcohol? Oh no, Satan took over the abbey and he´s the boozing guy of course.. Whoever else? I was also asking myself if entering the screen ´A Prayer of Hope´ is relevant for the game or not. From the right side of The Altair, there´s a screen that made me speechless for a moment. Super crazy! It´s about a tree and what´s hanging on it.. Another question I have is about the screen above that tree. I was jumping on the top of the tree to look if there´s anything interesting. There are platforms and a destroyed bridge, but you can´t reach the top ´cause the platforms are too far away from each other. But it seems there are two ways at the left and right side. To be concerned with the history of their protagonist was very important for the developers. At the time when I completed the game for the first time (in normal mode), the ending made sense to me, but it was still a bit depressing. How was that possible? If Satan can be beaten in hard mode, this question will be answered. I was hoping that it would explain the screen with the destroyed bridge and the platforms to reach a different ending. The ending is comprehensible, according to the history of the Cathars. I wanna spoil something now, so if you haven´t played the game yet but want to, don´t read the next part. Religions are something I don´t understand. Some people are practicing religions peacefully (that´s how it should be), but with the centuries, the usage of religions by the humans has changed. Why did the Christians trapped the Cathars if the fifth commandment says to not kill? The first commandment says: ´Thou shalt not have other gods before me.´ The Cathars negatively spoke about Jesus, so according to the Christians, they broke with the first commandment. That led the Christians to break with the fifth commandment by themselves. The second commandment is: ´Thou shalt not take the name of the Lord thy god in vain.´. Maybe the Christians did not do this, but they also didn´t accepted that other people have a different opinion like they have. I don´t believe in any gods and say: Live and let live. I often don´t agree with the lifestyles of others too, but if they let me live my life, they should do their own thing as well, right? It´s the same today between all those pretending believers. They say: There is only one god, my god. I don´t accept it if you believe in anything else. The results are extreme hostilities, which brings me to the conclusion that the world would be much better without religions and a lot of blood wouldn´t have been spilled without them. When the Christians began with the Albigensian Crusade, they acted against their own god. Neither God nor Jesus would support the death of so many humans. It´s the same for today´s Islam. L´Abbaye des Morts is the reason why I began to think about all this, in a time when the world is dangerous enough. Hard to say how the world would look like if the Cathars would still exist, but for sure the Cathars never had the intention to kill other people! I recommend everybody to play this game. PlayOnRetro deserves the support and the materials are of great quality. Only the bunch of spelling errors and grammatical mistakes in the instruction manual are a pity and unnecessary. Even if you have no interest in the story of the game, it´s something for fans of Solomon´s Key and Montezuma´s Revenge. Like I mentioned before, the game is very short. But I can´t part with the general expectations of today´s people who are always looking for ´long´ games. Not everybody has the energy after work to play an adventure for hours. The Abbey of the Death is ideal for a chilling gaming session. Great work by the developers and publishers! 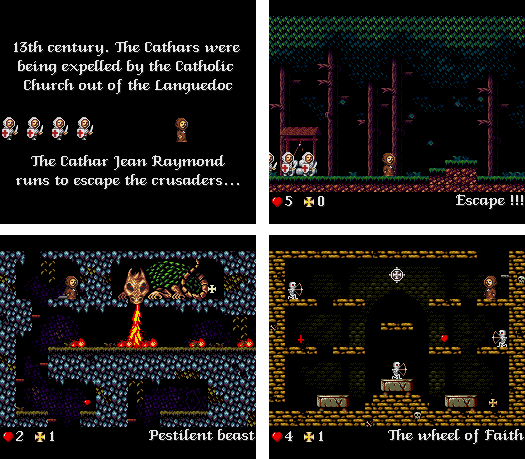 L´Abbaye des Morts can be downloaded for free for emulators. For the Mega Drive at home, the game is possibly available to buy on PlayOnRetro´s website.